One third of homes in Florida rely on septic systems, or onsite sewage treatment and disposal systems (OSTDS), to treat and dispose of household wastewater, which includes wastewater from bathrooms, kitchen sinks and laundry machines. When properly maintained, septic systems can last 25-30 years, and maintenance costs are relatively low. 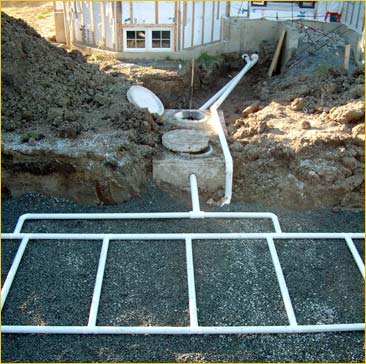 A conventional residential septic tank and drain field under construction. A general rule of thumb is that with proper care, systems need to be pumped every 3-5 years at a cost of about $300 to $400. Time between pumping does vary though, depending on the size of your household, the size of your septic tank and how much wastewater you produce. If systems aren’t maintained they can fail, and repairs or replacing a tank can cost anywhere between $3000 to $10,000. It definitely pays off to maintain your septic system! The most common type of OSTDS is a conventional septic system, which is made up of a septic tank (a watertight container buried in the ground) and a drain field, or leach field. The septic tank’s job is to separate out solids (which settle on the bottom as sludge), from oils and grease, which float to the top and form a scum layer. The liquid wastewater, which is in the middle layer of the tank, flows out through pipes into the drainfield, where it percolates down through the ground. Although bacteria continually work on breaking down the organic matter in your septic tank, sludge and scum will build up, which is why a system needs to be cleaned out periodically. If not, solids will flow into the drainfield clogging the pipes and sewage can back up into your house. Overloading the system with water also reduces its ability to work properly by not leaving enough time for material to separate out in the tank, and by flooding the system. Sewage can flow to the surface of your lawn and/or back up into your house. Failed septic systems not only result in soggy lawns and horrible smells, but they contaminate groundwater, private and public supply wells, creeks, rivers and many of our estuaries and coastal areas with excess nutrients, like nitrogen, and harmful pathogens, like E. coli. It is important to note that even when traditional septic systems are maintained, they are still a source of nitrogen to groundwater; nitrate is not fully removed from the wastewater effluent. How can you properly care for your septic system? Here are a some basic tips to keep your system working properly so that you can reduce maintenance costs by avoiding system failure, and so that you can reduce your household’s impact on water pollution in your area. Don’t flush trash down the toilet. Only flush regular toilet paper. Toilet paper treated with lotion forms a layer of scum. Wet wipes are not flushable, although many brands are labelled as such. They wreak havoc on septic systems! Avoid flushing cigarette butts, paper towels and facial tissues, which can take longer to break down than toilet paper. Think at the sink. Avoid pouring oil and fat down the kitchen drain. Avoid excessive use of harsh cleaning products and detergents, which can affect the microbes in your septic tank (regular weekly or so cleaning is fine). Prescription drugs and antibiotics should never be flushed down the toilet. Limit your use of the garbage disposal. Disposals add organic matter to your septic system, which results in the need for more frequent pumping. Composting is a great way to dispose of your fruit and vegetable scraps instead. Take care at the surface of yourtank and drainfield. To work well, a septic system should be surrounded by non-compacted soil. Don’t drive vehicles or heavy equipment over the system. Avoid planting trees or shrubs with deep roots that could disrupt the system or plug pipes. It is a good idea to grow grass over the drainfield to stabilize soil and absorb liquid and nutrients. Conserve water. You can reduce the amount of water pumped into your septic tank by reducing the amount you and your family use. Water conservation practices include repairing leaky faucets, toilets and pipes, installing low cost, low-flow showerheads and faucet aerators, and only running the washing machine and dishwasher when full. In the US, most of the household water used is to flush toilets (about 27%). Placing filled water bottles in the toilet tank is an inexpensive way to reduce the amount of water used per flush. Have your septic system pumped by a certified professional. The general rule of thumb is every 3-5 years, but it will depend on household size, the size of your septic tank and how much wastewater you produce. By following these guidelines, you can contribute to the health of your family, community and environment, as well as avoid costly repairs and septic system replacements. You can find excellent information on septic systems a the US EPA website: https://www.epa.gov/septic. The Florida Department of Health website provides permiting information for Florida and a list of certified maintenance entities by county: http://www.floridahealth.gov/Environmental-Health/onsite-sewage/index.html. 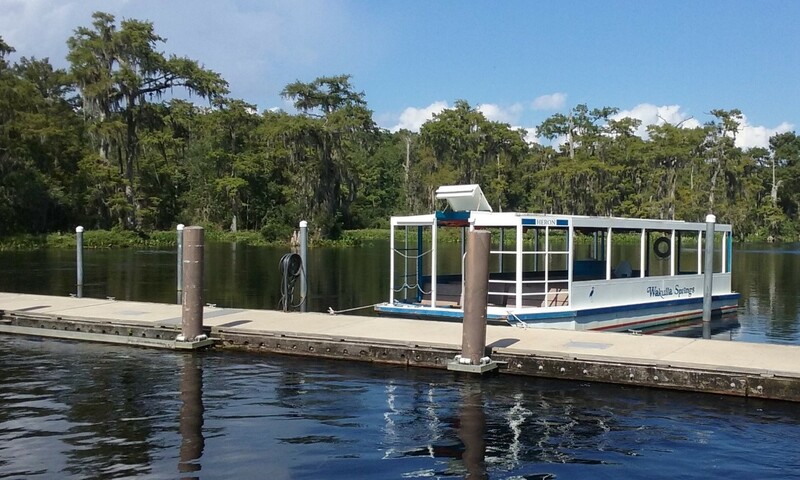 The Department of Environmental Protection (FDEP) identified septic systems as the major source of nitrate in Wakulla Springs, located in Wakulla County. Excess nitrate is thought to promote algal growth, leading to the degradation of the biological community in the spring. 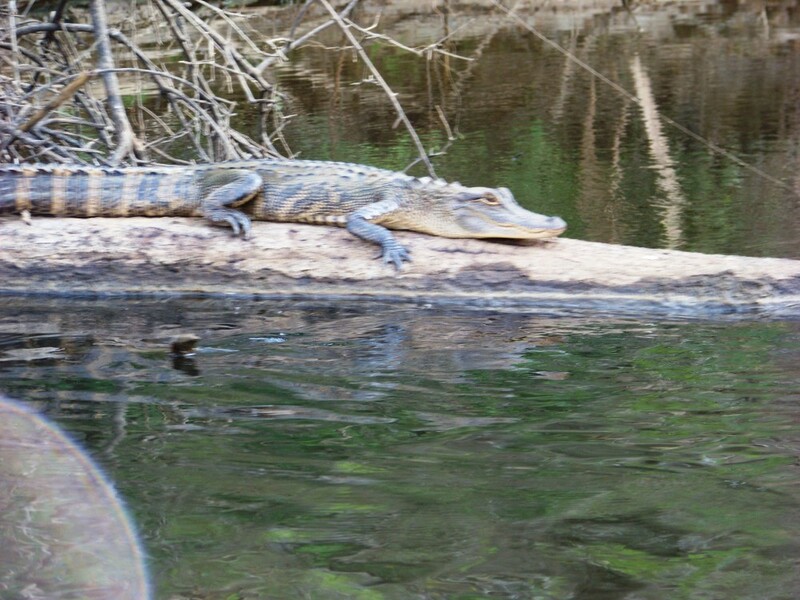 Look Who Is Enjoying the Beach This Spring… An Alligator! I received a call the week before Earth Day to let me know that an alligator was laying on Pensacola Beach, on the Gulf side, near the gate to Ft. Pickens. This is certainly not something you see every day. Two, Can alligators tolerate salt water? Let us start with question 1 – is this weird? Question 2 – can they tolerate salt water? The quick answer is yes, for a period. There are several reptiles in Florida that can tolerate periods of seawater. Those who spend long periods in brackish to marine waters have lachrymal glands to remove and excrete salt from their blood stream. This keeps the cells of their body in a more “fresh” environment and thus, can tolerate salt water for longer periods. Marine turtles, the most salt tolerant of all reptiles, excrete this salt through these glands located near their eyes. This gives them the appearance of “tears” or “crying” when they are on land. They are actually secreting salt from their body. Alligators do not have well developed lachrymal glands. However, their tough skin is impermeable to absorbing seawater. They have thinner areas of skin where saltwater can enter and of course they can swallow seawater. Because of this, they cannot tolerate seawater very long and must eventually return to freshwater. Alligators, like most Florida reptiles, do have to bask on land to warm their bodies in the morning. This is needed for proper digestion as well as other functions. It is also another way that alligators can avoid salty water for periods of time. I understand the alligator still had the faint yellow cross bands on its tail, indicating a younger animal, who may have wondered into the wrong location. Any alligator can become a problem when fed. They lose their natural fear of humans and see us as a source of easy food – though they more often go after our pets, which are easier; they are more willing to approach us looking for an opportunity. Thus, is against Florida law to feed alligators. I am not sure whether the alligator seen that week was acting aggressively or not but certainly could have been a problem. A “nuisance” alligator is defined by FWC as one being larger than four feet and acting aggressively towards humans or pets. If this is the case, they have a team of trappers who will come to collect the animal. It is not recommended that individuals try to capture these animals. As with snakes, many people bitten by alligators were trying to either catch them or kill them. It is best to leave this to the professionals. Though it is a bit nerve racking to see an alligator on the beach, they are part of Florida’s environment. Like sharks swimming along our shores, alligators should not be approached but rather contact a local authority to alert them of the possible danger. Am I Living in a Floodplain? Floods are a common concern in many areas of the U.S. Gulf coastal residents should be particularly aware. Floods may come in the form of flash floods, which come with little warning. Other flood conditions come on slower, as with large thunder storm fronts and tropical storms. With hurricane season not far away, it’s a good time to think about your property and the floodplains in your area. Photo: Courtesy of the Northwest Florida Water Management District. Floodplains are broadly defined as land susceptible to flooding by any source. Areas designated as flood hazard areas are known also as “base flood” or “100-year-flood” zones. However, this can be confusing to some. A 100-year-floodplain does not mean that once your property floods, you’ll most likely not see it flood again for 100 years. The calculation actually means that there is a 1% chance that flooding will occur in any year. Floodplains are calculated by statistical estimates based on historical storm data. Most mortgage lending agencies and banks, as well as real estate and insurance companies are well informed sources regarding floodplain information. Floodplain maps are updated periodically and are available for the public online and in print. 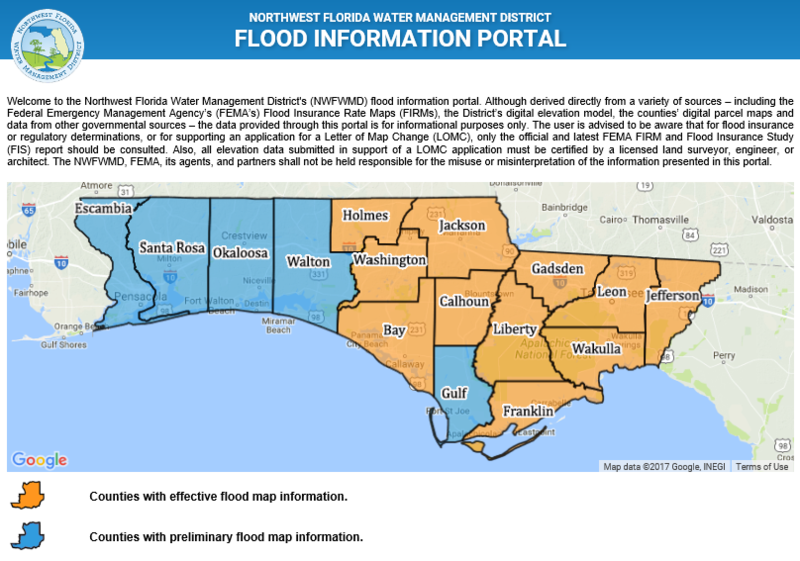 FEMA’s National Flood Insurance Program has recently revised the digital flood insurance rate maps for many counties in Florida. 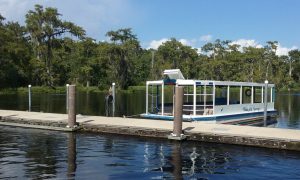 The Northwest Florida Water Management District (NWFWMD) offers a great tool for us in the Panhandle. 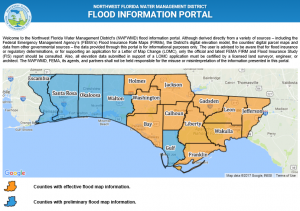 The NWFWMD has created a map website, known as the “Flood Information Portal”. This site is dedicated in showing the extent of areas of flood risks. The site is also helpful in determining flood insurance rates and building requirements. The site is very user friendly with a search function, where one can search for floodplain information for a specific address. A detailed report can also be generated showing both the effective and preliminary flood map for the particular address selected. The map website can be found at http://portal.nwfwmdfloodmaps.com. For more information please contact your local county extension office and county, or city, planning department. Before a flood strikes, find out if buying flood insurance is right for you. If you are in an areas prone to flooding already, consider modifying your home to combat any future flooding issue. If you believe your property is at risk, please be prepared. Keep in mind that flooding in an area can lead to street closures, power outages and temporary reduction in public services. The Deepwater Horizon Oil Spill was one of the worst natural disasters in our country’s history. We are pleased to announce the release of a pair of new bulletins outlining how the 2010 Deepwater Horizon oil spill impacted the popular marine animals dolphins and sea turtles. 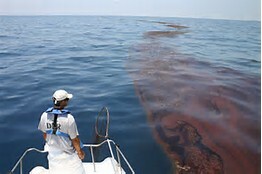 To read these and other oil spill science publications, go to http://gulfseagrant.org/oilspilloutreach/publications/. The Deepwater Horizon’s impact on bottlenose dolphins – In 2010, scientists documented a markedly increased number of stranded dolphins in the northern Gulf of Mexico. Was oil exposure to blame? Could other factors have been in play? Read the answers to these questions here: http://masgc.org/oilscience/oil-spill-science-dolphins.pdf. Sea turtles and the Deepwater Horizon oil spill – This publication reviews the estimated damage oil exposure caused to sea turtles and discusses continued research and monitoring efforts for these already endangered and threatened species. Click here to read this bulletin: http://masgc.org/oilscience/oil-spill-science-sea-turtles.pdf. “Sea turtles and oil spills” presentations – On March 23 in Brownsville, Texas, more than 100 participants gathered in person and online to listen to scientists, responders, and sea turtle specialists explain what we know about how these creatures fared in 2010 and detail ongoing conservation programs. Watch videos of the presentations here: http://gulfseagrant.org/sea-turtles-oil-spills/. 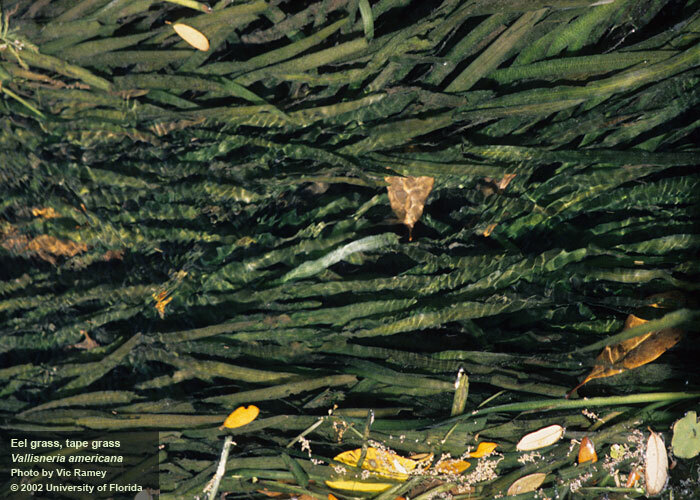 Vallisneria americana, also known as tape grass or eel grass, is a common native aquatic weed in the state of Florida. Tape grass has tall, grass-like leaves that are a light green in coloration and rise vertically from the crown to the top of the water. Once the leaves reach the top of the water, they casually float along the surface. Common tape grass Vallisneria americana. The technique of propagation is by runners. These runners grow out from the crown along the sand and new plants arise from the end of them. There are separate male and female plants, although they grow on the same plant. The female flowers are on lengthy stems, which reach to the surface. However, the male flowers are loosely attached at the base of the leaves. When released, the male flowers float to the surface where they move alongside the female flowers to fertilize them. A good way to distinguish tape grass from other weeds is to observe the leaves and the tips. Tape grass have round leaf tips while many other weeds have pointed leaf tips. In addition, tape grass is a submerged weed that possesses long, ribbon like leaves. There are several uses for tape grass. Restoration of the pond floor is a useful purpose. One of the benefits of tape grass is that they are great oxygenators. Tape grass is also a common home based aquarium plant. They provide an eye-catching scene that fish and humans enjoy.